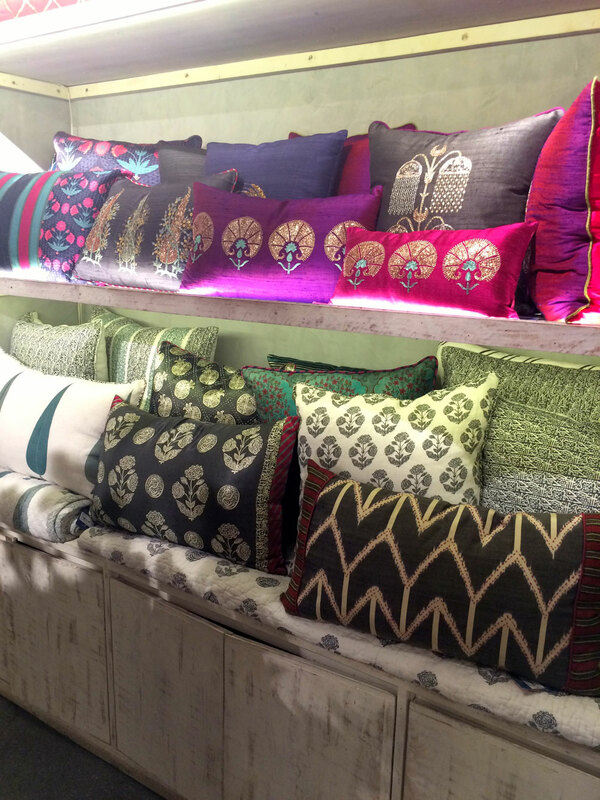 A textile lovers dream…so many colors, patterns and textures to choose from! But that could also turn out to be overwhelming! So here’s my visual journey and a few tips to help you navigate through the choices and pick those pillows that work perfectly together. A walk through and taking it all in! Color – What are the colors you want to go with? Pick at least 2 primary colors and a couple accent colors you want to play around with. In my case I was buying pillows for a gray couch. The other factors I considered were a gray and gold rug and a navy daybed in the same space. So I picked grays, metallics and blues as my primary colors with accents of gold and hot pink! Number – Depending on how big your sofa/couch is you may need to choose anywhere between 2 to 6 pillows. I personally prefer an odd number – 3 or 5 or 7! They help break pattern and color. 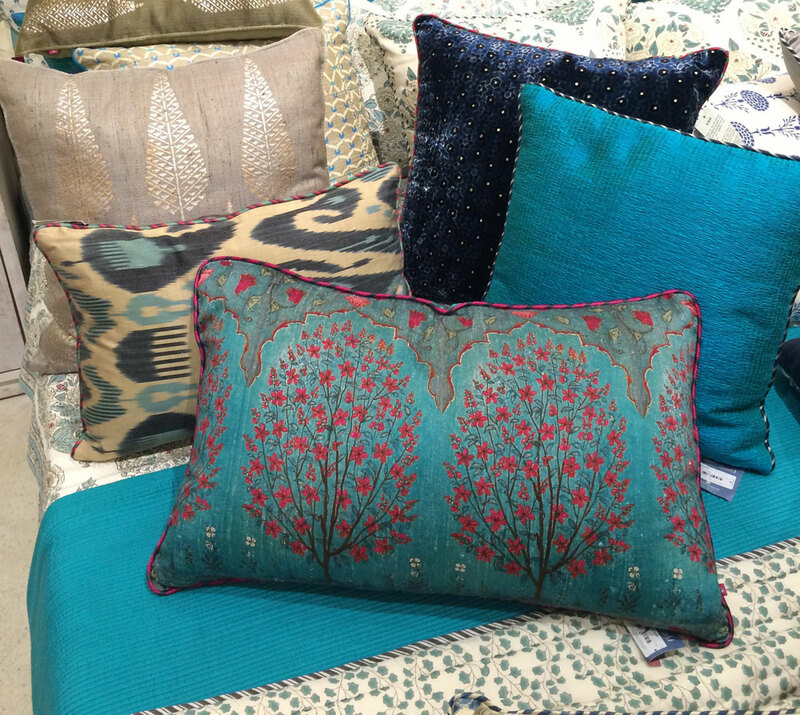 Pattern Play – Its always easy to pick 2 of a kind and have matchy pillows. But thats neither fun nor does it really add the visual interest you want it to add. So its important to work with a variety of patterns and textures and colors. Within your colors pick at least one or two larger pillows that are neutral and use texture. You can add interest using 1 large scale pattern and then blend with a few pillows with small scale pattern all staying within the same color family. Here’s what I worked with. 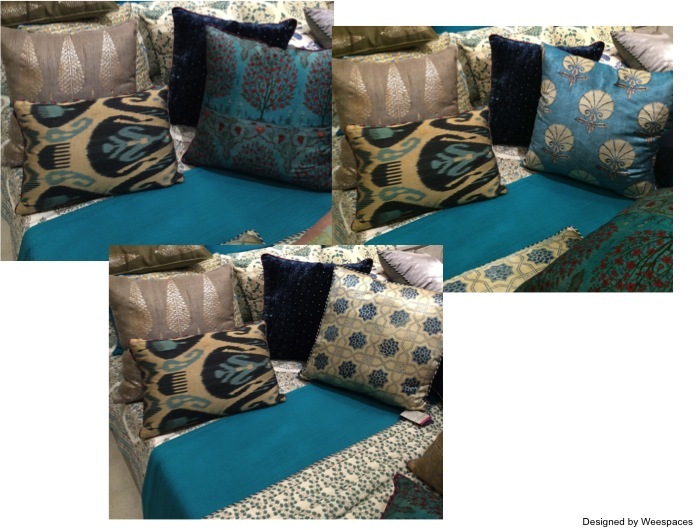 I settled for the neutral gray with metallic accents, a beautiful ikat lumbar pillow and a navy velvet larger pillow. Then I played around with a few patterns in a smaller scale. Oh and never underestimate the power of a solid pillow to tie them all in together! And the final five 🙂 I love them! WeeArt wednesdays is your guide to handpicked affordable and beautiful art for your home! Every wednesday we pick a piece that talks to us and we hope we can help you with some artful picks for your home. This weeks pick is the Orange Sky wall art by Vinati Bhatt from the Discover India collection available at the Tadpole store. I love black and whites and this one juxtaposed with a vibrant orange makes for a beautiful and striking conversation piece in your home. 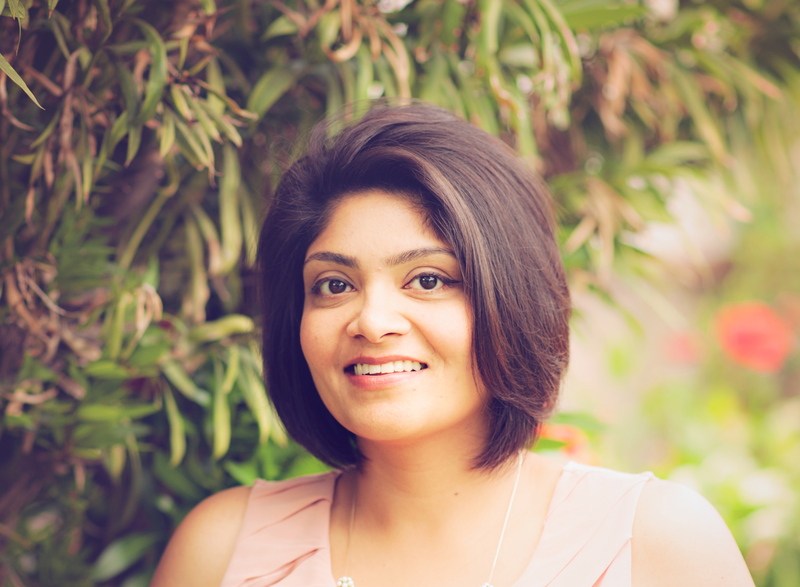 A weekend in Fort Kochi! I spent a long weekend in beautiful Fort Kochi, Kerala. I’ve visited Kerala a few times in the past…but this trip was special for two reasons! 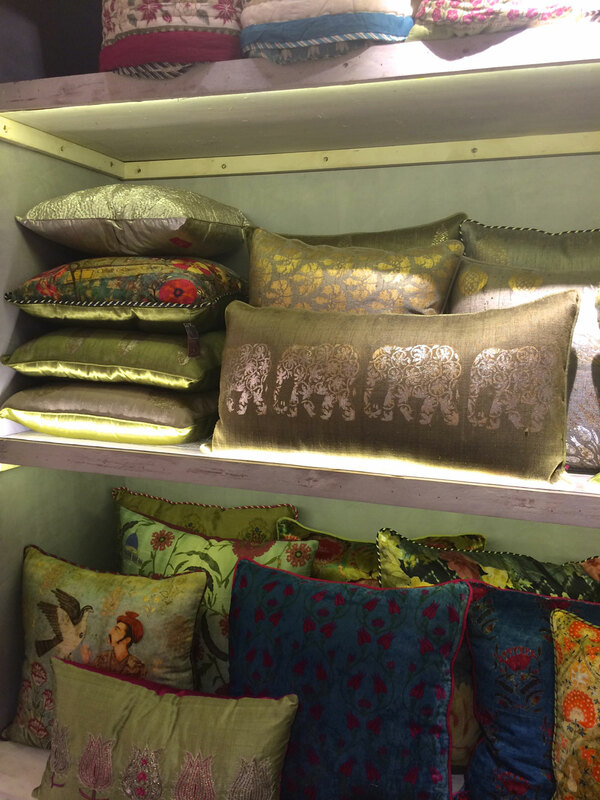 One it was my first vacation with the kids in India and second it was a design lovers dream! From the art, architecture, colonial and antique furniture, woodcarvings and beautiful artifacts to the sheer beauty of everything around, it was quite an eyeful! We stayed at the lovely Brunton Boatyard and it does a great job of transporting you to another time. Gorgeous arched hallways, beautiful colonial furniture and fabulous service! Lots of cafes to visit and enjoy a good book with a cuppa, art galleries and little shops. One of our most memorable meals was a four course tasting menu at the Eight Bastion! Sublime south indian flavors and spices presented in small plates. I stumbled across wood carvings and figurines, beautiful marble top colonial tables, cane back chairs of various kinds, plantation chairs, brass urlis of various shapes and sizes and much more! Like they say in gods own country there’s beauty everywhere you look! 4 tips to get your curtains right! I always get asked if we design only kid’s spaces. And the answer is no. While we started out with the vision of designing unique spaces for kids and families….we have worked on living rooms, bedrooms and patios. We pride ourselves in being able to design spaces keeping kids in mind, which can be challenging! But we also enjoy the freedom of working on spaces without those constraints, where we can bring in that glam glass top coffee table or the floor length mirror! I also think that some of the basics of creating a beautiful functional space work across all rooms. 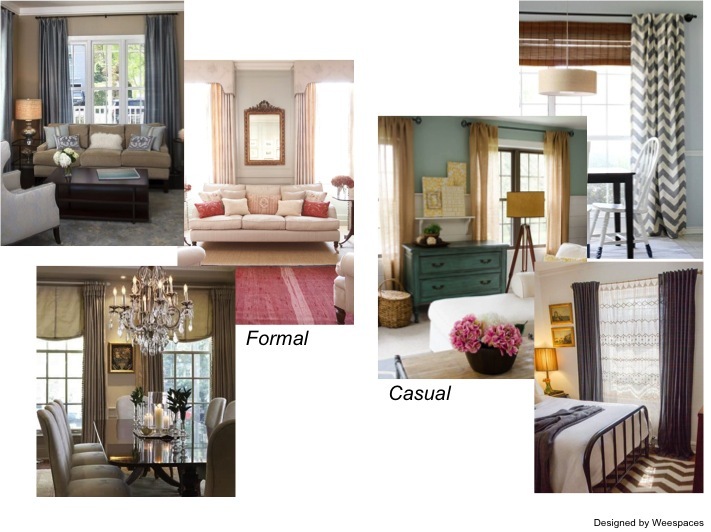 One of those is curtains and draperies….the concepts extend through to every space. 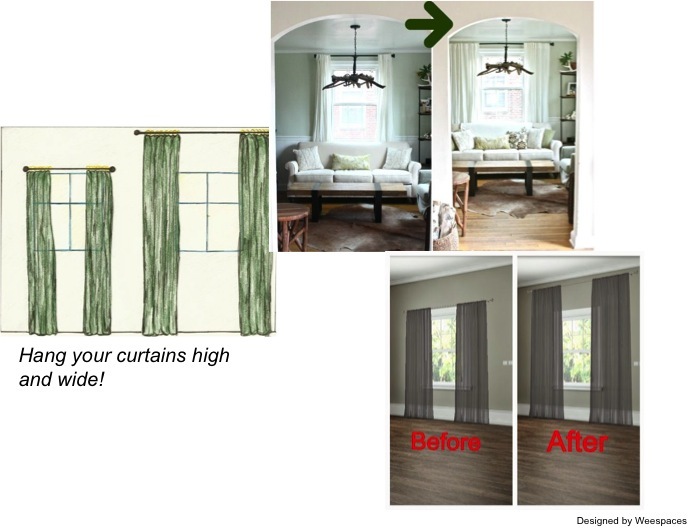 So here are my 4 favorite tips when you are looking to get curtains for any room! If I had to say one thing about curtains then this is it! Most people end up with curtains hung from the wrong height. To make the most of your curtains, you want to hang them closer to your ceiling above the height of your doors/windows. That adds height to the space and visually makes your ceilings appear taller! Go all the way to the floor! Curtains that end an inch above the floor are not something you want…they visually cut the height of the space! Imagine wearing an ankle length saree…you get the point! 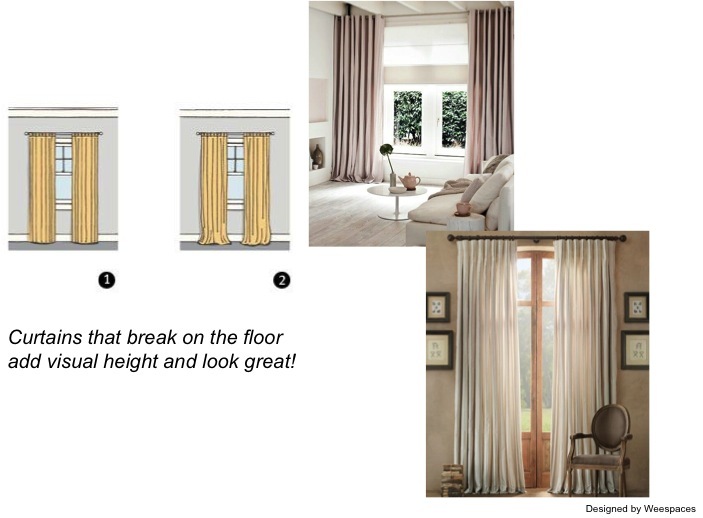 Long, flowy and gently pooling or breaking on the floor is how you want your curtains to look. Generally a 1-2inch break is a good rule of thumb to go by. While curtains that pool can create a dramatic luxurious effect they may not be practical for everyday living spaces. Having thick blackout curtains in a living room where you want the natural light to come through or sheers in a bedroom where you need privacy are no – no’s! It’s important to keep in mind the purpose of the room and pick your curtains accordingly. Texture is another important parameter….silk and heavier fabrics usually make for a more formal setting while cottons, linens and lighter fabrics are more casual. Curtains need to gather to create the right effect. You don’t want to skimp and get 2 panels in place of 4 and draw them flat all the way to cover your windows. A general rule of thumb is to halve the width of the curtains for gather. 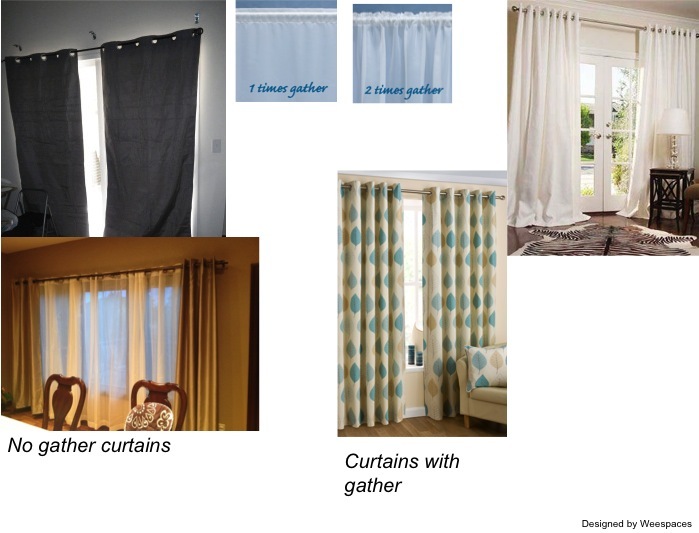 If you have a 48” wide curtain, it will cover 24” with gather.